Posted on October 20, 2017 at 7:42 am. Does any part of your tiled floor sound hollow when you walk over them? Do any tiles make a sound or feel less than solid? If so, there is an underlying issue. The problems might be with the adhesive that is meant to hold the tiles to the substrate. Hollow sections under the tiles, areas that should have adhesive, will cause movement problems and perhaps make a sound when you walk over them. Good adhesive should bond the tiles directly to the substrate. The problem here is more than aesthetic. Even if noise and the feel of the floor does not bother you the tiles connected to the problem will be subject to extreme stress. These tiles will be prone to breakages, and the tiles may well come loose from the floor. Most commonly inadequate adhesive holding the tile in place. Use of the wrong type of adhesive. Water, even moderate moisture, causes the adhesive to not bond well. The adhesive was left to long before the tiles were laid, having already dried, at least on the surface. Excessive moment of the floor will loosen tiles. A flexible adhesive will largely prevent this sort of problem. These problems with moving and insecure tiles of poor installation or the wrong adhesive. It is not the fault of the tiles themselves. It is possible to get very good flooring results with moderately priced, even cheaply priced tiles. 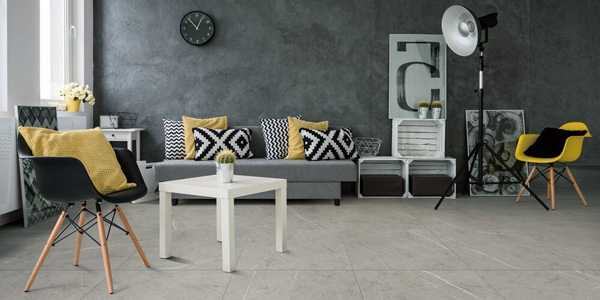 If you find a style of tile that suits you taste then make sure the installation is done correctly. The tiled floor should last for many years.